A VPN (Virtual Private Network) is basically software that gets you on a private network such as UNMC from anywhere. If you’re trying to pull up something from home and it’s not working, chances are you need to set up a VPN connection. 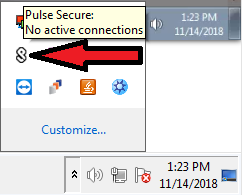 Connect to "UNMC Full Access"
Then launch the Remote Desktop application from PACS. If you don't have "RDP" as an option in your top tool bar in PACS, click Preferences --> Main Tool Bar, and move "RDP" from the "Available" list to the "Display" list. Then click "Apply" and "Ok", and select "RDP" from the main tool bar. This will launch Remote Desktop - enter your IP address and username and password to login to your computer.